Fox are prevalent throughout the United States. There are four main fox species active in North America. This includes the the Swift and Kit fox, which is found in the western part of America and the Gray and Red fox which is found on both sides of the country. Like the coyote, fox have learned to live amongst man. They have adapted well to urbanization and have learned to take advantage of man while living in our backyards. Watch this short video to see a Red Fox walking around in the woods. Fox are well adapted to live around man and here in the United States, they will be found around all major cities and urban areas. Mostly nocturnal by nature, fox will adapt their feeding patterns to fit the terrain. They prefer to hunt at night but will forage into the morning hours after dawn to harvest local animals. Fox will feed on a variety of food. This includes carrion, rodents, insects, fruit, vegetables, small animals like pets such as cats or dogs, livestock and birds. Fox tend to be more solitary and only are found in pairs during mating season. Fox are not known for their speed but rather their ability to move about undetected and silent. They are able to stalk the smallest of prey with precision eyesight and deft hearing. 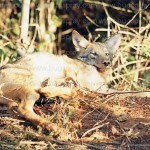 Female fox will have 3-10 pups from March to May, depending on the part of the country. Fox are solitary. Their den will only house a female and her young. Fox become a problem when their feeding leads them to our gardens, livestock or pets. But sometimes the damage they do can be hard to find. Fox love pheasant, quail, chicken and turkey. They also love eggs and can cause huge financial losses to both the commercial farmer as well as the weekend gardener. As people build ponds stocked with fish, turtles and other live animals, fox will find these areas and quickly learn to feed on the bounty. Such refuge provide a quick meal; these small “ponds” offer no protection for the fish and wildlife man tries to keep as pets. Its hard to blame the fox for their actions. In the wild, their feeding serves a purpose. However, in urban areas, conflict is now occurring. This video features a young red fox which is perfectly comfortable coming into the back yard of a home in a residential neighborhood and bedding down for the day. The “noise” heard in the back ground is the air conditioner compressor located just 20 feet away. 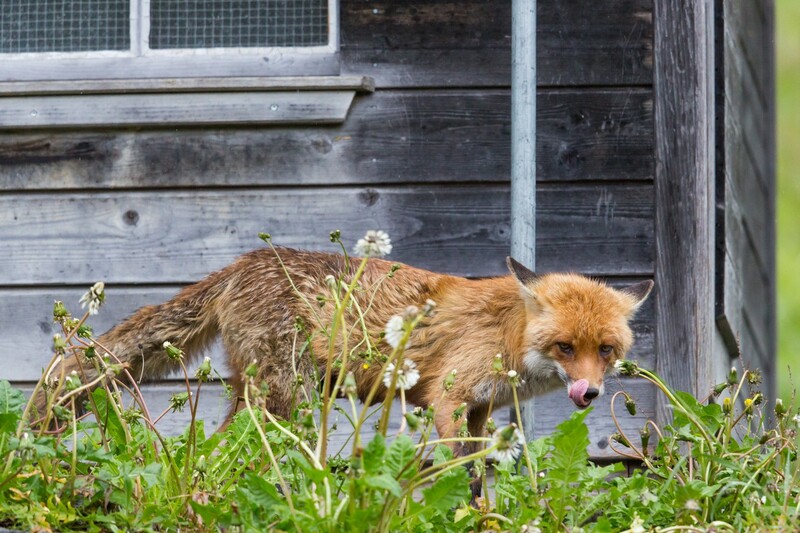 Homeowners are now more likely to see a fox in the wild more than in any other time of our countries existence. These animals are fun to watch and many times welcomed when first found. However, be aware of their presence. Small pets are particularly vulnerable to attack by fox and are no match for a wild fox. Both cats and dogs are easy prey as well as all the beautiful birds, squirrels and chipmunks around the bird feeder. 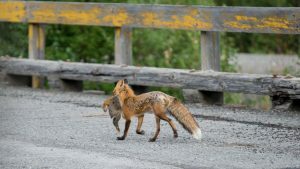 If you are seeing a lot of activity by a local fox, be careful. They have been known to carry the rabies virus as well as other disease. Remember, a fox is not a “dog” which wants to be petted and you should never feed them intentionally. 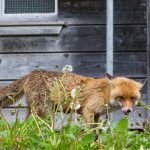 Because of the damage they can do to fish, birds or pets, local fox activity can sometimes need to be controlled. 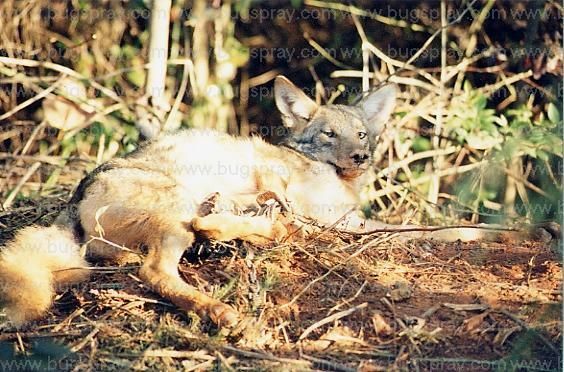 This can be done using a range of live traps including snares, leghold traps and live cages. You can also repel them from your property so they don’t get comfortable on your land. For the average homeowner wanting to safeguard their pets, fish or children, this can be done using our SOUND REPELLER. Our Sound Repeller is quite unique in that it has many features not common to most any similar device. Be default, it uses ultra sound when triggered. This sound alone can be enough to drive any fox from the area. But our unit also uses a light bar to flash a bright LED light. And there is an optional “audible” sound you can dial on up to 100 DB’s. This sound will vary and often times is enough to keep any wary fox from coming around. Our units can be powered using 4 “C” cell batteries or the included AC power supply that comes with each unit. For fox, you’ll get fine results relying on batteries and the motion detector to trigger the unit on. When used this way, the unit will sense motion from up to 40-50 feet away and turn on for 20 seconds. 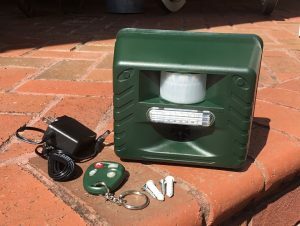 During the time its on, the ultra sound will be sent out along with an audible sound (assuming you’ve dialed up the volume) and the light bar will blink (if the unit is triggered at night). Units come with a handy remote wireless “key” so you can turn them on/off as needed. This key has an “alarm” button too which triggers a super loud audible blast so if needed, you can use this to spook intruding fox or other animals too. To trap a fox, you can use leghold, snares or cages. Leghold and snares have been used to catch many fox and though catching fox in live cages is thought to be hard, it can be done. 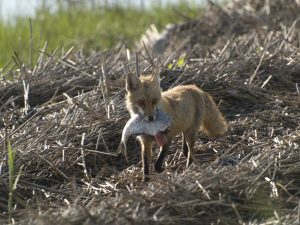 The most common type of trap used for fox is the leghold. This includes both COIL and LONG SPRING design. Leghold traps can be used many ways and are really only as limited as your imagination. If you are an experienced trapper, you probably have a list of “go to” sets. 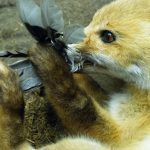 As a beginner, we suggest you get our FOX AND COYOTE BOOK which details several methods and sets. Common places to trap a fox are where they den, where they trail and where you find paw prints. 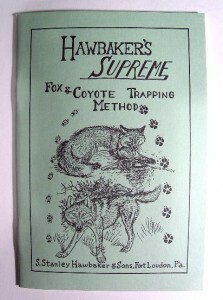 Other tips and trapping “tricks” are covered in the book making it a good read for anyone wanting to learn how to live trap fox (and other canine species). 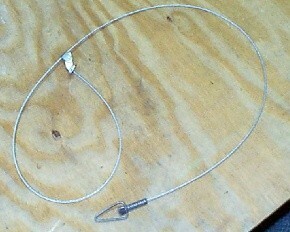 For fox, the coil traps are about as easy to set and conceal. When used correctly, they’ll catch your target without injury. The Coil 1.75 trap features a 4.75″ wide jaw when set and this is plenty for any fox. If you prefer to use the more “traditional” design, the Long Spring 11 has a 4″ jaw spread and has been around longer than most any other big game trap. For the more experienced trapper, SNARES can be super effective. These are the least costly to use but to be effective, you must put more afield. Snares are precision traps and must be set along trails, pathways, holes or in exact locations where you know fox travel. Its important to anchor your snare too. And remember, snares will irritate animals more than most any other trap so be prepared to deal with an angry fox when animals are caught. When using leghold traps or snares, adding scent to the set will often attract fox sooner and keep them active in the area which in turn increases the likelihood of success. The best way to use scent and lure is subject to the trapper, the conditions, the time of year and more. In general, there are two main types of scent. The first is FOX URINE. Fox will routinely “mark” their territory using urine. This signals to other fox they’re active in the area and that this specific range is occupied. The fox you’re targeting will hopefully get wind of the urine and come around to investigate. When fox react to other scent, they can let their guard down allowing for success. We offer urine in pints, 1/2 gallon and gallon jugs. In general, 3-6 oz per trap set will be enough to get their attention from afar and keep them focused as they approach the area. The second type of scent you can use is a GLAND LURE. Glandular scent are released by fox during rut and throughout the year. Mostly used to mark their territory, some markings can be received as hostile. Again, these can cause a fox to drop his guard and step into a trap properly placed. 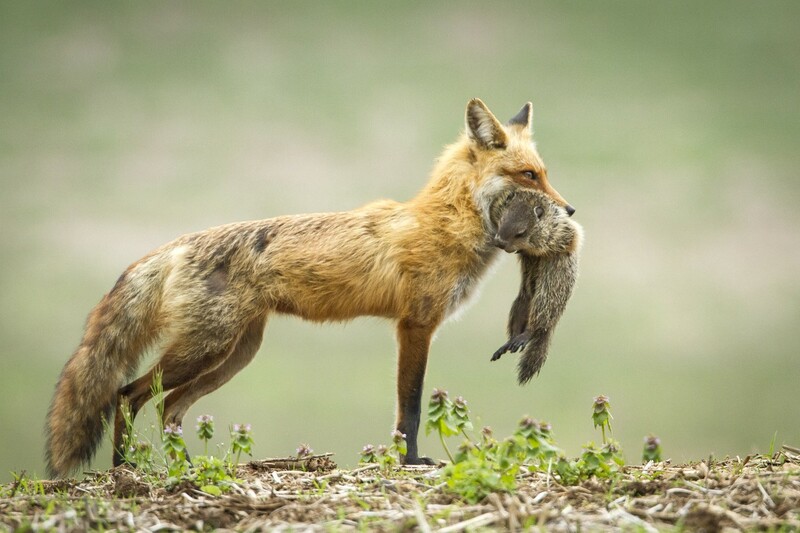 Glandular lure is harvested from fox and is somewhat specific to each species. It does not mean one scent might work “better” compared to another. But we do carry two “flavors”. So if you know you have red fox active in your area, you may prefer to use RED FOX GLAND. We also have GRAY FOX GLAND. Another method of trapping which used to be thought of as impossible to do is to use a large wire cage design. Recent trap engineering combined with “step trapping” methodology will enable you to live trap fox. 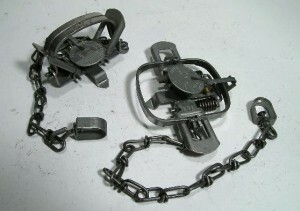 Step trapping is the process of putting a trap out unset with the door wired open. Food is then presented to the target animal over a period of nights. It is recommended that you offer food outside the trap the first night, at the traps entrance the second night and then in the trap the third night still without actually setting it. It is also suggested that the trap is disguised by covering it with landscape debris like sticks, leaves and other nearby plant litter. A very effective way to camouflage the trap is to utilize pine straw bales built around the trap. The trick is to completely surround the trap including the sides, back and top. Pull straw through the mesh from inside the trap to help hide the wire. Be sure to use either mud, dirt or more straw to cover the bottom of the cage. The following video features a live trap set being this way by a professional trapper. Fox are accustomed to seeing straw stacked this way as they are accustomed to seeing wire in farm areas. 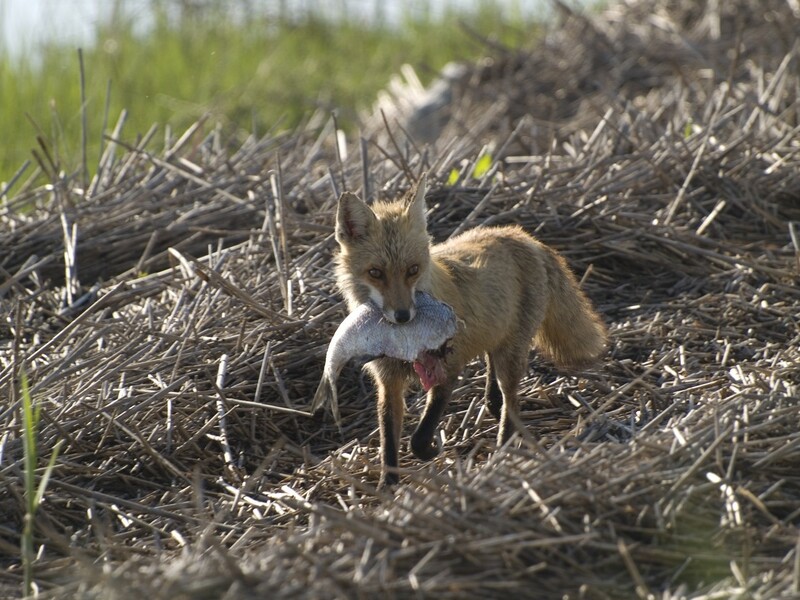 To have success live cage trapping fox, you first need to know they’re active in the area. Second, try to locate the trap set where fox are known to be hunting or prowling around. Most people think this must be in some remote area in a wooded lot but if there are fox foraging in your back yard, that would be a great place to start. 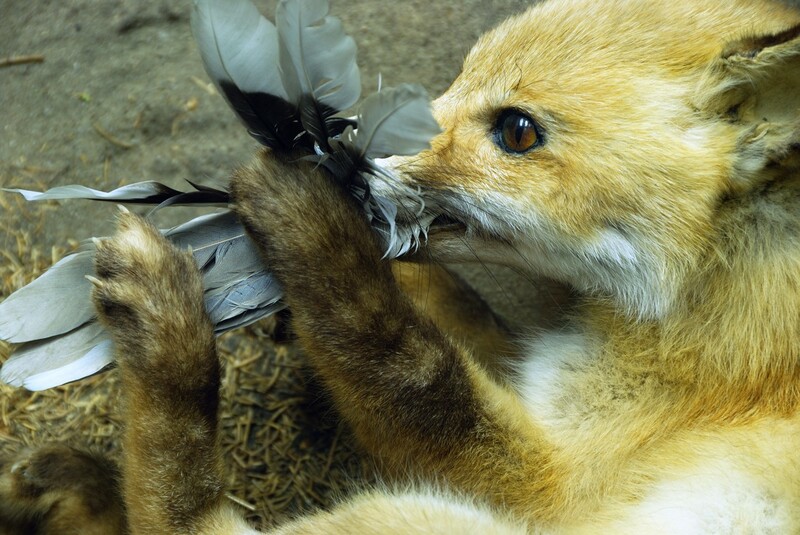 To pique the fox, lightly brush some fox gland lure on the traps frame and trip pan. This will serve as a signal to local fox that the trap has been in use by another fox. And if the trap has been disguised as detailed above, they will be very comfortable entering and foraging around it. Remember, fox are very much used to entering chicken coops and other holding areas that hold pets, livestock or birds. In fact one of the best places to set this trap is in a barn, pen or other livestock cage where fox have either been entering or trying to enter. So if you have a chicken coop, dog kennel or some other fenced in area fox of infiltrated, instead of spending lots of time and cash shoring up the fence, try allowing access for the fox along with a live trap cage inside. Upon entering the pen, they are expecting to see wire and hay so a proper trap set won’t make them wary. But out in the wild, fox are more wary of a live trap which is something not natural to the terrain. 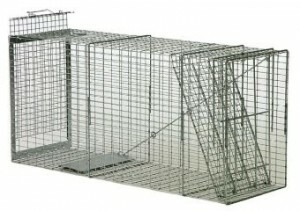 To keep the fox comfortable and unsuspecting of your intentions, use a large trap like our LT152248RD. This trap features a sliding rear door making it easy to bait and service. Fox will readily feed on most any red meat, chicken or fish and a good portion placed behind the trip pan will generally get them inside if you have “step trapped” for 3 nights prior to making a “real” set. But if you don’t want to wait, get our trap fitted with the LIVE BAIT CAGE. For this setup, we wire the live holding cage to the interior back section of the trap which allows the bait cage to house a small animal as live bait. This Bait Cage is perfect for a chicken, squirrel or rat and since fox can’t resist what they believe to be an easy meal, live trapping them will be a breeze. Traps fitted with live bait cages can be set up in one night meaning you do not have to “step trap” to get the fox comfortable. This trap measures 15″ wide by 22″ tall by 48″ long. The LIVE CAGE measures 6″ x 13″ x 14″ and has a door for live animal placements. 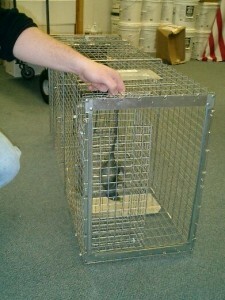 This picture shows the trap with the live bait cage installed and a “rat” inside. 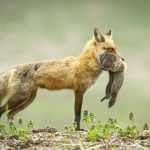 Fox are well distributed throughout the United States and are becoming more of a problem in urban areas. They are causing destruction and damage to gardens, livestock and other wildlife. Though essential to the balance of nature, all species will readily take advantage of easy prey. Homeowners, weekend gardeners and farmers are finding more and more damage caused by these canines and once they find a good place to feed, they won’t stop coming around looking for their next meal. To keep fox out of your yard, install Sound Repellers. But for nuisance animals needing control, use either Coil, Bridger Long Spring traps, snares or live cage traps for complete leg hold traps. Snares can also be used and don’t forget urine and lure in order to make the best set. Live traps can be used effectively as well and our handbook for making the perfect set will prove to be a big help.